Miso is a type of soybean paste that has been fermented. Although this paste has many uses, its most commonly used to make miso soup, a quintessential part of Japanese cuisine. Miso soup is known for its umami flavor and is associated with a wide variety of health benefits. Miso soup is a healthy soup made with fermented soybean paste, fish stock and seaweed. This soup is a good source of vitamin K and antioxidants. Miso soup is a light, nutritious soup that is commonly consumed in Japan. It's become increasingly popular in Western countries because of its health benefits. Miso soup is traditionally made from fermented soybeans. However, miso can also be made from soybean paste mixed with grains or beans. This means that not all miso is gluten free. Shiro (White) Miso: White miso is the standard flavor of miso, made from soybeans and rice. This type of miso is light in both color and flavor. It's sweet, slightly salty taste means that it can be used for a range of foods, not just soup. Shinsu (Yellow) Miso: Yellow miso is like white miso but is made from soybeans and barley rather than soybeans and rice. It's fermented for a bit longer than white miso, but still has a mild flavor. Mugi (Barley) Miso: This type of miso is like yellow miso but is fermented for an even longer period. This fermentation brings out the barley flavor, but keeps the overall taste mild and fairly sweet. Aka (Red, Brown or Dark) Miso: This type of miso is red or brown in color, made primarily from soybeans, and much darker than the other varieties. Its flavor is a lot stronger and saltier than most other types of miso. This type of miso may be fermented for up to three years. Miso soup can be made from any of these types of miso paste. The clear, light soup you see in restaurants is often made from white miso, but dark miso and other types of miso are often used in stir-fries, stews and other foods as they have stronger flavors. Miso soup also has small amounts (between 1 and 4 percent of DV) of protein, fiber, calcium, copper, iron, magnesium, phosphorus, potassium, selenium, zinc and B-complex vitamins. Miso soup's calories are very low at just 20.4 per serving. Miso soup is also rich in beneficial antioxidants. These don't just come from the fermented bean paste. The fish broth (also called dashi) and vegetables that are part of this soup have been shown to increase this food's antioxidant activity. The only negative aspect of miso soup's nutrition is its sodium. While this can vary depending on the type of miso paste you've chosen, a serving of miso soup usually has about 13 percent of your DV for this nutrient. Recipes for miso soup can also integrate other ingredients, like sesame oil, sesame seeds, cubes of soft tofu and daikon radishes. When served as a meal, rather than an appetizer, miso soup may even have fish, shellfish, potatoes or other more filling ingredients. Putting such ingredients in miso soup will obviously influence its nutritional content, but it's unusual to find additions beyond the odd vegetable. The more common substitution is the removal of dashi in favor of a vegetarian or vegan alternative. 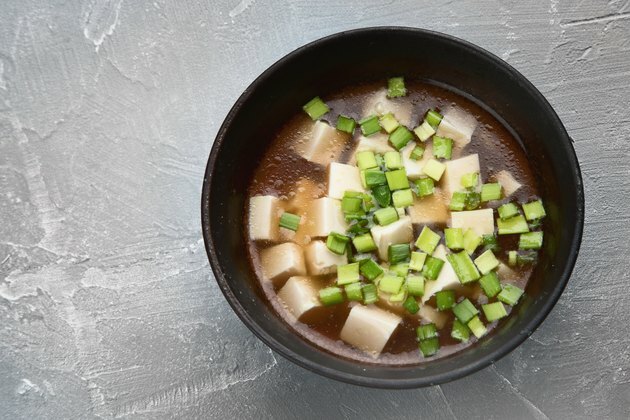 Although miso soup may not seem like a particularly beneficial food based on its nutritional content, bioactive compounds in miso form during the fermentation process. Fermented foods are known for being good for the health of your digestive system. Fermented soy products, like miso, also have neuroprotective effects. The bioactive compounds have been shown to have antioxidant, antidiabetic and anticancer properties. A 2018 study in the Journal of Nutrition & Food Sciences showed that miso can improve skin moisture and potentially eye moisture too. Miso soup's bioactive compounds may also be good for your heart, though these findings are mixed. Miso soup is known for being salty. This is partially due to the fermentation process. However, although there's a lot of sodium in miso soup, it doesn't seem to negatively affect your cardiovascular health. In fact, consuming miso soup seems to decrease the risk of cardiovascular disease and associated mortality. However, this finding was only relevant to women and not men. Other studies have shown that miso soup can benefit your heart and counteract sodium-related health issues, though. A 2013 study in the Journal of Clinical and Experimental Hypertension showed that miso can help reduce sodium-related high blood pressure. However, this effect hasn't been consistent: A 2017 study in the Journal of Internal Medicine showed that consuming miso soup was able to reduce heart rate but not blood pressure. Regardless of whether miso is good for your cardiovascular health, it should still be consumed in moderation. Eating foods that are high in sodium can increase your risk for gastrointestinal cancer. In the context of miso soup, however, this means three to four bowls a day or more. Fortunately, moderate consumption of miso soup has no ties to gastrointestinal issues like cancer. This means that a few bowls a week of miso soup can be a perfectly reasonable amount if you want to take advantage of miso's health benefits for your heart, brain and digestive system. Circulation: Association of Dietary Intake of Soy, Beans, and Isoflavones With Risk of Cerebral and Myocardial Infarctions in Japanese Populations: The Japan Public Health Center-Based (JPHC) Study Cohort I. Which Probiotics Does Miso Contain? How Much Weight Can You Lose If You Just Eat Soup for 2 Weeks?